This is the first time I’m doing a watchalong and I’m quite excited. The first pick was Master & Commander and we watched it before and are now posting the answers to the questions today. I have seen Master & Commander before and always liked it. The story is suspenseful, the characters are interesting and what is even more important to me, the cinematography is stunning. It is one of those movies you can re-watch and you will see it in a different way every time. Is Aubrey a good Captain? I think this depends on how you define a good Captain. He certainly is a very charismatic Captain and his people would do everything for him. He is also said to be very lucky and since seamen seem to be a very superstitious lot, it’s good for him to be considered lucky. This assures their respect. But apart from being charismatic and lucky, he is adept and very cunning. I’d say, it’s the young boy, Blakeney who looses an arm but stays so brave and poised. The boy is very intelligent and learns a great deal as well from the Captain as from the doctor. I liked how he is able to pick the best from every one and make the best out of every situation. Cpt Aubrey and Dr Stephen Maturin, the surgeon are very different. How did you like their friendship? Is it plausible? They are perfect contrasts and they make each other’s characters shine because they are so different. I did however not always think it all that plausible. The discussions yes, I can see that you can be very different and still have a great friendship, great discussions but I would doubt a man like the Captain would enjoy to play music with the doctor. Aubrey and Maturin disagree on the responsibilities of a ship’s captain. Who is right? I do belive that in general Aubrey is right. He is a very capable Captain, he knows his business but in this particular instance, he isn’t following his own principles anymore. He has become a fanatic, drive by his ego. Maturin, rightly tries to reason with him but to no avail. What did you think of the way the French are depicted? They are shown to be the aggressor and very sneaky too. But, as the end shows, they are also very cunning. I didn’t have too big a problem with that. The French are shown as negative but not as stupid, on the very contrary, it’s because they are so cunning that Captain Aubrey feels challenged. The story of the Jonah is quite intriguing, What did you think of it? Seaman are said to be superstitious and it isn’t surprising. Life on a ship is hard and you are constantly exposed, to your enemies, the weather conditions, nature… It’s a precarious life. As much as they believe in luck, they believe in bad luck. The story of the Jonah is a means to explain why they are running out of luck. They try to catalyze the tensions and pick a scapegoat. It’s very unfair and shows how easily the seamen believe in tales. I thought it was very uncanny. What was more important – getting the enemy or collecting scientific samples? That depends on the point of view but I would say, the mission was over and they could have dedicated their time to collecting samples. They were not told to follow the French to the end of the world. Was it ethical to disguise the Surprise as a civilian ship? It was a fantastic idea but I think, no, it wasn’t ethical. It served its purpose. I was wondering if something like that could have happened. Were there rules of warfare? I don’t know. Did you think the ending was satisfying? I have, as I said, already watched the movie before but had completely forgotten the ending. I was surprised to see that it ended like this. It was satisfying because it showed how clever the enemy was but there is no proper end to the story. I’m meanwhile surprised they didn’t make a sequel but I’m glad they didn’t. Those sequels often water down a orginal idea. The end also showed that the French Captain was as obsessed as Aubrey himself. These are two worthy opponents. As many of you know, we are doing a double watch along of two movies, the first one being Master & Commander. Here are the questions should you want to participate. Of course you do not need to answer these questions, you can also just post a review on the movie and link to my site. Tha date for the watchalong is Tuesday 27 December 2011. The questions for Talvisota will be published tomorrow. 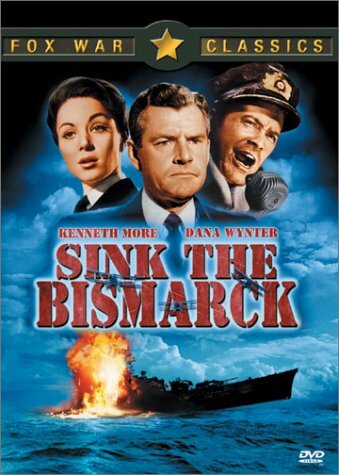 The British black and white movie Sink the Bismarck! tells the true account of one of the most difficult moments during WWII. The new German battleship the Bismarck was the biggest and most powerful battleship to ever cruise the sea. A frightening enemy that had to be stopped before it could break loose and reach the Atlantic. The war on the North Atlantic was at its height and so were the British losses at sea. Sink the Bismarck! switches back and forth between scenes in the war room and scenes at sea. As a narrator states at the beginning of the movie, the war is fought at sea but the decisions are made in the war room. The scenes taking place in the war room resemble many others that are depicted in British movies but they are much more psychological. The filmmakers decided to focus closely on Captain Shepard who has been promoted and is in charge of the navy on land and on his assistant, Anne Davis, a young woman whose fiancé died at the beginning of the war. Shepard himself is grieving for his wife and one of his sons. He is shown as hard and rigid in the beginning but he changes considerably over the course of the movie. The people around him, although annoyed by his harshness, still know that he has to take some of the most difficult decisions that have to be taken during the war. The most tragic moment in the movie is certainly when the biggest British battleship, The Hood, is sunk within minutes of attacking The Bismarck. It explodes in front of the eyes of the rest of the British fleet which is close by. After this has happened Churchill gives one of his famous speeches and utters the memorable words “Sink the Bismarck!”. We all know what course history has taken so it is not too much of a spoiler to say that the British navy, together with the assistance of the pilots of aircraft carrier Ark Royal, did manage to sink the huge German fortress. Quite a tragic moment even for the British. No one really cheered. There is something eerie about naval combat; many people die when a ship is finally sunk but the ships themselves are lost as well and they often look like gigantic wounded animals dying a violent death. The British TV series Hornblower or Horatio Hornblower is based on the books by C.S. Forester starring Ioan Gruffudd (King Arthur) as Horatio Hornblower. 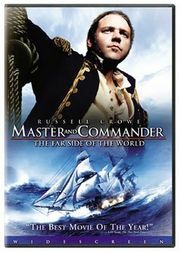 It is the movie that is closest to the fabulous Master & Commander that I have seen so far. Sure, there are older movies on the Napoleonic Wars and naval combat but this is my favourite. I think there are a total of 8 installments. They mostly have two titles, a British and an American one.